THE HAKUTSURU-JYO、 AIZU-JYO CASTLE IN SNOW. THOUGH I TOOK THIS PHOTO 6 YEARS AGO、 I HAVE SEEN THE SAME ONE ON TV THE OTHER DAY. 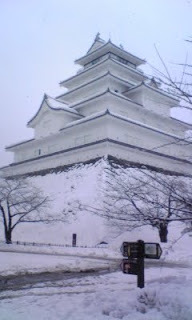 IF U WOULD LIKE TO WATCH THIS BEAUTIFUL CASTLE PLS GO TO AIZU AT ONCE. BUT IT IS SO COLD THAT U MUST WEAR VERY WARM. IT HAS BEEN FROZEN IN ALL JAPAN THIS WINTER.AND WE HAVE HAD TOO MUCH SNOW. THEY SAY IT WILL CONTENUE TILL NEXT WEEK.